Some people say that the era of handheld consoles, actually, any consoles, is long gone. With the advent and popularisation of MMORPGs and various Android games, very few seem to remember that some twenty years ago, a video game console was the only reason why some many schoolchildren wanted to go back home. As for portable Game Boy, lots of people, both kids and grown-ups, could not part with this precious toy. Yes, good old days… Currently, we play games whose graphics are so realistic and astounding that we barely believe that everything surrounding us is virtual reality. The sound is fantastic, the storylines are captivated, the sceneries are elaborate, and the characters are flawless. Nevertheless, there is something that always bugs the representatives of the first generation of gamers who used to value hardcoreness and uniqueness, something that modern, sophisticated games lack. Fortunately, some emulators make it possible for true gaming connoisseurs to play their favourite old-school games on computers or other devices. GBA emulator and GBA ROMs are everything you need to revive that unforgettable experience of catching Pokémon and helping Mario rescue a cute princess from an evil dragon’s claws. However, before downloading ROMs from such websites as Romsmode.com, Loveroms.com, or coolrom.com, you may want to recall the best games that made Game Boy Advance a legend. We suggest familiarising yourself with the list of the GBA most popular games that once thrilled the gaming world. This game, probably, was created for those who liked outdoor activities but still didn’t venture to play them. Players were entrusted with tools to set up their hitting and pitching, to control fielding mechanics. This game’s graphics also was quite decent at the time it was released. Baseball was a devastatingly popular sports simulator that won the heart of lots of players from all over the world. Now you also have a chance to try it out on your emulator. Released, in 2004, Kirby & the Amazing Mirror surprised players with a completely different game formula. That time developers decided to give up the traditional level-based progression system, but opted for the autonomous world-based system, instead. In the new Kirby, gamers had a chance to travel different realms and eerie worlds connected by myriads of labyrinths and dungeons. At the same time, the game managed to preserve its authentic charm, inherent cuteness, and simplicity inherent in the majority of good old mini-games. Do you remember Disney characters, Goofy, Donald Duck, and Pluto that have to fight against the darkness in a mysterious castle along with anime-looking Sora and Riku? Yes, we are talking Kingdom Hearts. Developers decided to switch to 2D graphics and introduced deck building and card-based combat system into the original game’s sequel, which added special charm and individuality to the franchise. The game enjoyed great popularity among players and remains one of the most playable GBA games. The Mario franchise is one of the most important gems in the Nintendo’s crown. Super Mario Advance 4 was welcomed by hordes of fans in different corners of the world. Those sliding down slopes, mysterious blocks, vines growing up into the sky, and rivers of lava that don’t bode well for characters – are what people have always liked about Mario. Developers introduced eight unique worlds. Improved graphics and sound effects also contributed to the game’s success. You are one of those gamers that recall the adventures of the superhero with deep nostalgia; then, it’s high time that you availed yourself of a Super Mario Advance ROM and started playing it right now. Pokémon Ruby and Sapphire are representatives of the third generation of the Pokémon video game series. The primary mission characters had to accomplish remained unchanged. Players were to catch as many cute creatures as possible. It also was required to train them properly to beat the elite group of other Pokémon trainers. Still, Nintendo introduced some novelties, which included double battles, which made it possible for four players to participate in the game, and new Pokémon abilities. It also became possible to connect the game to an e-reader. So, don’t hesitate to download a Pokémon Ruby ROM to become the coolest Pokémon trainer that ever existed. Pokémon Emerald was a successor of the game’s earlier Ruby and Sapphire version. Though the gameplay was mostly the same, some new changes had been introduced. Both trainers and Pokémon stats were substantially upgraded. Moreover, Emerald made it possible for players to fight in two-on-two battles. Now you have an excellent chance to compare Emeralds with its predecessor with the help of a Pokémon Emerald ROM. 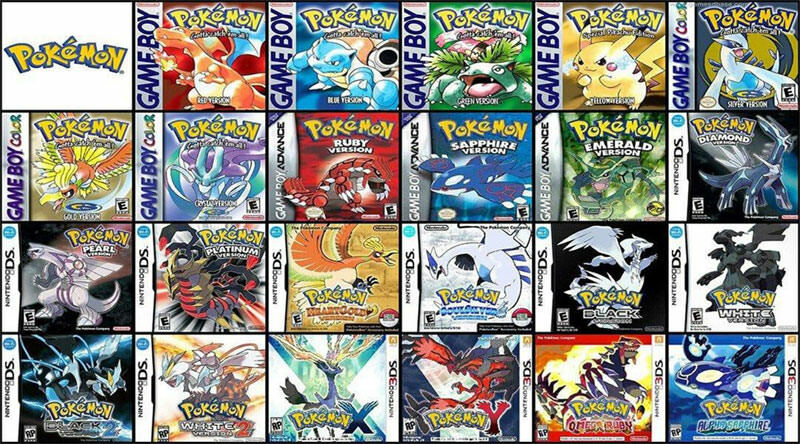 Finally, let us introduce the latest versions within the Pokémon franchise – Pokémon FireRed and LeafGreen, which are enhanced remakes of previous games. Notwithstanding critics arguing that FireRed and LeafGreen had not been substantially improved in comparison with the earlier versions, the game became commercially successful. It would be fair to note that some significant changes were incorporated into FireRed and LeafGreen, however. According to Wikipedia, Pokémon FireRed and LeafGreen “contained usability enhancements such as a contextual tutorial feature which allows players to look up data at any point in the game.” Moreover, the new system made it possible for players to check the last four actions they performed, which allowed to plan to develop a specific strategy for the successful completion of the mission. Thinking about trying this version out? Knock yourself out! A Pokémon FireRed ROM, as well as a Pokémon LeafGreen ROM, is waiting for you! Now, when you have familiarised yourself with the list of the coolest GBA games, you can decide what ROMs to download to quench your nostalgic thirst and get maximum pleasure from gameplay. Don’t forget about the fact that while you are procrastinating, someone else is enjoying the best creations of Nintendo.